Dr Won treats end-stage hip arthritis with total hip replacement using the anterior approach when suitable. The advantage of the anterior (front of hip) approach as opposed to the traditional approach is that the muscles are not cut, resulting in less soft tissue damage, more rapid recovery, enhanced hip stability and reduced post-operative pain. Following an anterior approach hip replacement, typically patients can go home after 3-4 days with a scar of 6-8cm. Hip precautions are also not required, and patients are permitted to sleep on the operated side, flex the hip over 90 degrees, and sit cross-legged. If the anterior approach is not suitable, Dr Won can also perform the hip replacement using the traditional approach. Dr Won also employs a range of tools to enhance accuracy of the hip replacement procedure. These include using intraoperative fluoroscopy (real-time x-ray), utilising 3D patient-specific implant blocks, and applying the robot-assisted technology to enable greater precision. At present, the robot-assisted technology is available at John Flynn Private Hospital. Hip implants can sometimes fail due to trauma, infection, instability or just wear and tear over time. Dr Won is experienced with revision surgery utilising revision systems and bone grafting techniques. 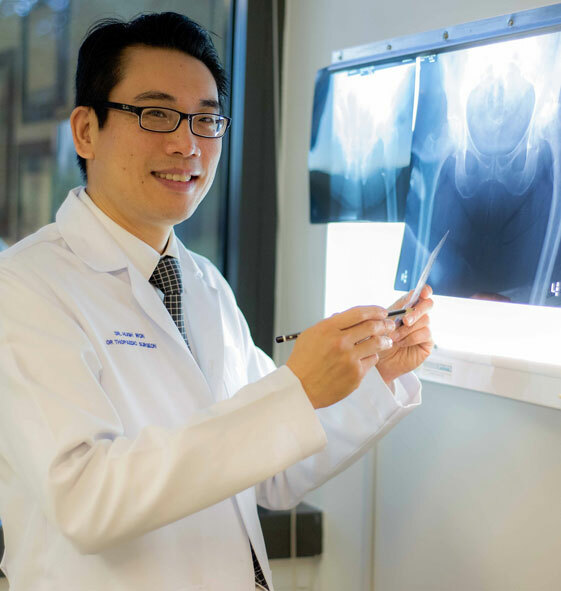 Dr Won offers keyhole hip surgery for the treatment of labral cartilage tears, loose bodies, synovitis and femoroacetabular impingement.